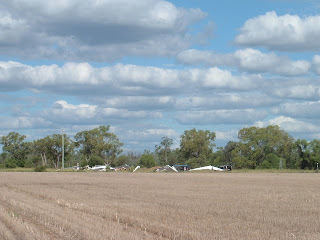 Today Friday the 13th the weather finally improved to set a good task, via a waypoint to Condamine 138km away. 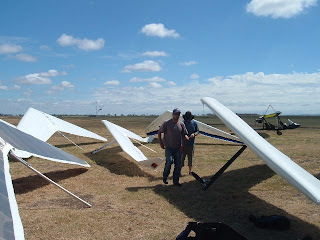 I got off fairly late but managed to drift downwind and hav some great flying, the weather improved down the course and there were strong thermals to 1500m. I flew over some interesting countryside and met more eagles, all very friendly. I was too busy to take photos. I had two low saves and managed to get up again and finally make goal, there were about 10 others there out of 40 competitors so I did fairly well. 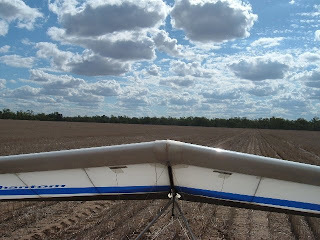 The photo of the gliders far away is where I landed in the goal field.